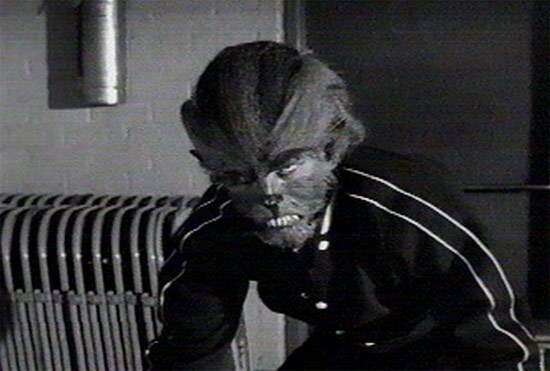 Tony Rivers (Michael Landon), the lead character in 1957’s I Was A Teenage Werewolf, is a teenager. In fact, he’s one of those troubled teenagers that were all the rage in the late 50s. He lives for kicks and spends too much combing his hair. He skips school. He stays out late. He gets into fights with other teenagers. He’s not dumb, mind you. He has plenty of friends and a girlfriend (Yvonne Lime) who only wants the best for him. He just has a hard time controlling his temper and his father (Malcolm Atterbury) isn’t sure what to do with him. However, Detective Donavon (Barry Phillips) has a possible solution! After the police are called to break up one of Tony’s fights, Donavon suggests that maybe Tony should seek professional counseling. In fact, maybe he could go see Dr. Brandon (Whit Bissell)! Dr. Brandon is a widely respected hypnotherapist and he has an office right next to the local airplane factory. Even though he doesn’t want to, Tony finally agrees to see Dr. Brandon. Even if he doesn’t say it, you can tell that Tony is thinking, “This is totally squaresville. Really melvin, maaaaaan….” the whole time. But Brandon gets results! In fact, you could argue that he gets too many results. After twice hypnotizing Tony and telling him to think of himself as being a wild animal, Tony becomes just that! That’s right, Tony turns into a werewolf and he’s soon running around town — in his letterman jacket! — and killing anyone that he comes across. Whenever Tony transforms back into a human, he regrets what he’s done. Unfortunately, it turns out that almost anything can cause Tony to turn back into a wolfman. Most werewolves need a full moon. All Tony needs is to hear the sound of the school bell…. To be honest, I imagine that most people who watch this film do so because they want to see a werewolf creating chaos while wearing a high school letterman jacket. Considering that this was a low-budget film made to play as half of a double feature, the werewolf makeup is actually fairly impressive and that letterman jacket adds just the right touch of weirdness to the whole affair. Make no mistake, it’s an entertaining and deeply silly film but, at the same time, it does have an interesting subtext. 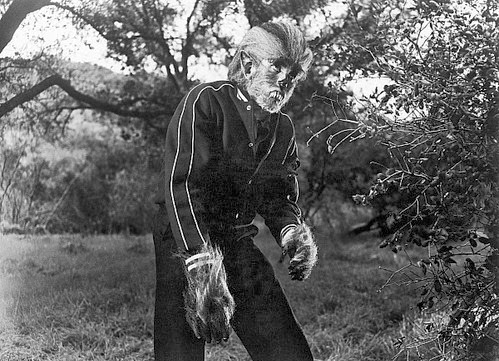 One could argue that Tony’s transformation into a werewolf serves as a metaphor for his struggle to grow up. Neither werewolves nor juvenile delinquents can control themselves and Michael Landon gives a performance that’s just sensitive enough to justify calling this one Werewolf Without A Cause. That said, the main appeal of this film is definitely the chance to see a werewolf in a letterman jacket.